Super great news! 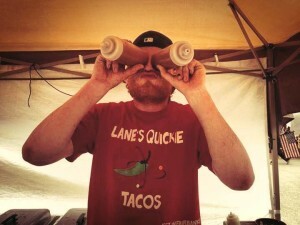 Every Friday this Summer, Lane and his quickie taco tent will be set up in the Biergarten serving up the finest tex-mex in town. Lane uses the freshest ingredients and a variety of special sauces and hot sauces to create his delicious creations. He usually has chicken, pork and beef but there are even vegetarian options. Served with smiles and love, you’ll never forget your first quickie! Tacos hand made with the freshest ingredients, served with smiles and good humor too. Cooked by Lane with meats, veggies, salsa, and seasonings bought locally and prepared in the Quick kitchen, you won’t find a fresher, healthier, and better tasting taco in town. With Wednesdays and Saturdays at the Tanana Valley Farmer’s Market, and Fridays at HooDoo’s brewery, we can now get our tacos, fajitas, soup and veggies tacos with the kiddos at the market or brewery for a family afternoon treat that everyone loves, or for an adult dinner with friends and a micro-brew, we love having three opportunities to get our Quickie Taco love on! In Texas, we say beef, it’s what for dinner, but in Fairbanks we often say Quickie Taco love, it’s what’s for dinner yay!Thanks Lane for bringing Taco Love to the frozen north, and for teaching Adam the fine art of the taco. Best tacos we’ve had since we left San Antonio! Now, what fresh beer to pair with your taco?